The Men's Force X adapts the technology of their technical rock shoe range and couples this with luxurious padding to create a shoe with unrivalled levels of comfort balanced with technical performance. The Force X features a cushioned heel lining which provides increased levels of comfort especially on longer days; this padding coupled with the easy entry provided by the Velcro straps makes the Force X ideal for long days and long routes where convenience and comfort are a top priority. V-Tension technology provides the balance between comfort and performance. 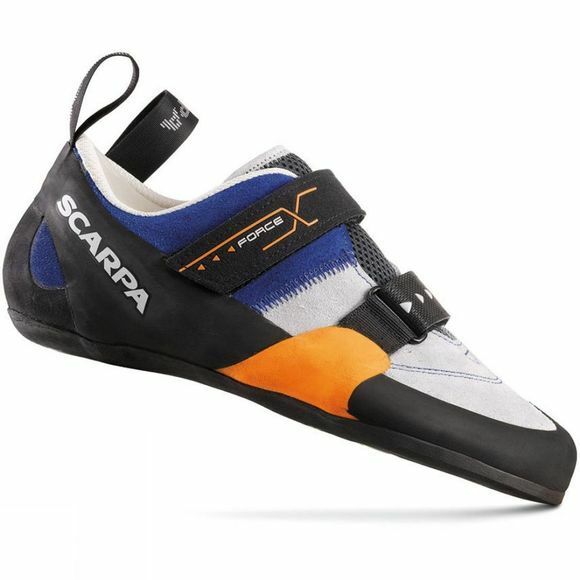 Adapted from Scarpa's technical rock shoe range, it connects the Velcro strapping to the toe and heel of the shoe giving a more precise fit and allowing more power in the toe area whilst not compromising on the sensitivity of the shoe.